Karachi : The Karachi Union of Journalists (KUJ) Dastoor has strongly condemned the mass sacking of journalists from The Express Tribune without any prior notice or plausible reason offered to the victims. 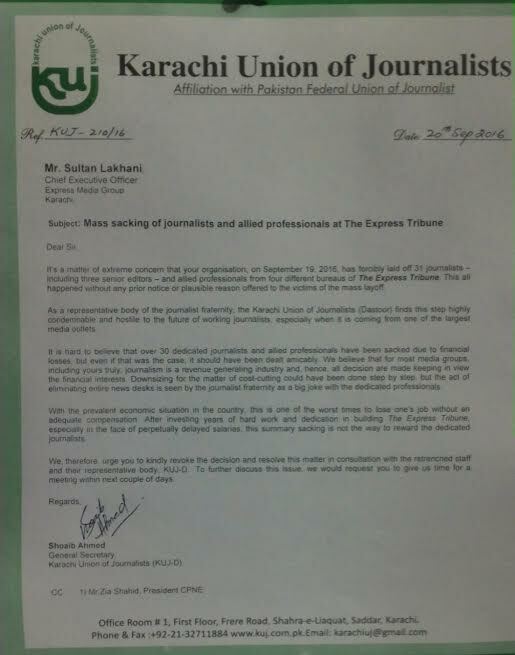 In a letter sent to the Express Media Group’s CEO Sultan Lakhani on Tuesday, KUJ Secretary General Shoaib Ahmed termed the mass layoff “highly condemnable and hostile to the future of working journalists”. A copy of letter was also sent to Mr Zia Shahid, President Council of Pakistan Newspaper Editors (CPNE) . The KUJ secretary general said that the media group on Monday had forcibly laid off 31 journalists – including three senior editors – and allied professionals from four different bureaus of The Express Tribune, including Islamabad, Lahore, Peshawar and Karachi. “With the prevalent economic situation in the country, this is one of the worst times to lose one’s job without an adequate compensation. After investing years of hard work and dedication in building The Express Tribune, especially in the face of perpetually delayed salaries, this summary sacking is not the way to reward the dedicated journalists”, Ahmed added. The KUJ urged the Express Media Group to revoke the decision and resolve the matter in consultation with the retrenched staff and their representative body.